Two fighters maintained perfect records as Strikeforce presented the ninth installment of its 'Challengers' series. Sarah Kaufman and Shane Del Rosario validated their undefeated status with spectacular wins over Roxanne Modefferi and Lolohea Mahe, respectively. Sarah Kaufman proved why she deserves a spot on a Strikeforce main event show. Kaufman took on a highly skilled Roxanne Modefferi who recently came off of a 'kind of a big deal' win over Women's MMA standout Tara LaRosa at Moosin in May. While both fighters displayed high caliber striking and grappling, it was Kaufman who came out on top with a knockout win via guard slam (that resembled something from a 'Rampage' Jackson Pride throwback, and will probably rack up 100k Youtube views before the month is over). Shane Del Rosario improved his record to 10-0 with a TKO win over Hawaiian fighter Lolohea Mahe. Del Rosario, who has only been out of the first round once, demonstrated the kickboxing skills that earned him the WBC Muy Thai Kickboxing Heavyweight Title back in 2008. After a brief exchange in the center of the cage, del Rosario caught Mahe with a dazing left hand. Del then pressed Mahe against the cage in the clinch, proceeded to batter the Hawaiian with knees to the body and head, and followed up with punches leading to the stoppage, just over the one-minute mark of the first round. In another highlight bout, cage bad boy Mike Kyle won his fifth in a row with a second round submission over an experienced Abongo Humphrey. Kyle is notoriously known for his bad behavior in the cage as post-bell punches have been a controversial part of his fight repertoire. 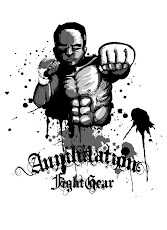 But, the current King of the Cage Light Heavyweight Champion displayed his best behavior both during and after the fight, gracefully shaking hands with Humphrey, who fell to 7-2 in pro fights. Why Sarah Kaufman's next fight WILL make a Strikeforce main event. . .